As professionals studying Cuba, probably the first question we are asked by people with only a faint acquaintance with the country is what will happen after Fidel Castro passes away. For years this observer’s pat answer has been that it depends on when he dies and how he dies. Does it happen tomorrow or in ten years? Does it happen suddenly or as the end of a lingering disease like dementia? These factors have indeed been crucial to any post mortem prognosis. Without knowing them, any prediction would have been largely guesswork. Yet time passes by inexorably, and as it does, it will be argued, a more discernable prognosis for a post-Castro Cuba finally becomes possible. • An older Fidel Castro, who has already suffered public falls and fainting spells. Now in his late seventies, the coming years will likely see a decline in his energy and activity even in the case of a prolonged biological survival. In a sense, the beginnings of the post-Castro era may precede his death and will almost certainly happen in this decade. • A gradual renewal in the executive branch of government. The last decade has seen the appointment of many ministers in their thirties and forties and a progressive retirement of leaders of Mr. Castro’s generation. Although these new ministers all profess an ideological commitment to socialism, their outlook must perforce be different than the one from their parents. For one, they have no personal recollection of pre-Castro Cuba or even of the economic transformation of Cuba into a socialist state. • A continuation of what might be termed the food problem in Cuba. Simply stated, a family cannot manage to feed itself on the basis of its income. • A more prolonged experience of socialist countries after the death of their patriarchal leaders and of countries which transitioned from communism. 1. A continuation of the socialist system in its current form. The Partido Comunista de Cuba (PCC) continues to have a monopoly of political power and the government continues to control almost all the means of production and distribution. Private enterprise continues to be severely limited and tightly controlled. This is precisely the divination proffered by PCC officialdom. Fidel Castro himself has stated that there will be no transition that annuls the accomplishments of the revolution and that in Cuba the political system of the future is already under construction [Radio Habana Cuba, 1998]. 2. Adoption of an open society model. The PCC becomes merely one player vying for power in a multiparty political system. The role of the government in production is significantly reduced if not totally eliminated. The Central European countries would be the models of this path. This is the post-Castro development path presupposed in much of the world outside Cuba. Indeed the mission statement of the ASCE itself states that “at the time of its founding, in 1990, its most important goals were to study the elements and processes involved in the expected [author’s emphasis] transition to a free-market economy and democratic society…” [ASCE]. 3. The PCC continues to maintain a monopoly in political life. However, economic policy is gradually reformed to allow an increasingly wider space for private enterprise, unregulated markets, and foreign direct investment. China, and to some extent Vietnam, would be the models for this path, which could be termed the Asian model. It is within the realm of possibility that a future Cuba may forge an altogether new and unprecedented path. For example, it could move from a left wing to a right wing dictatorship. But it is the conclusion of this paper that the likely course of Cuba will be much more akin to the Asian experience. This is perhaps a contrarian opinion (both inside and outside of Cuba), but it has economic and historical rationale. This paper consists of considering each alternative in some detail before arriving at its conclusion, followed by a brief exploration of the implications for American foreign policy. 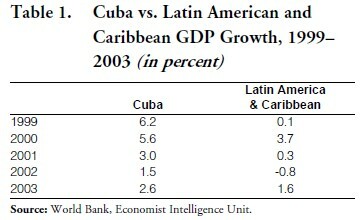 Since its nadir in 1993 following the disappearance of the Soviet Bloc, Cuban GDP growth has been comparable to the rest of Latin America and has actually been superior in the past few years, as shown in Table 1. At first blush, Cubans may be well advised to maintain the status quo. However, higher relative growth is an easier task when it follows a decline of over 30%, as happened in the early 1990s [Canler 2001]. Moreover, the methodology for the measurement of GDP is different in different countries, and in Cuba there is no consumption component to GDP. Thus it is possible that the economy may officially register respectable growth without there being much improvement in consumer welfare. So a more germane question is whether the average Cuban household is faring well enough to limit popular support for a change from the current economic system? As a basic human need, food is a major preoccupation of every household. An economic system that fails to provide sufficient nutrition for its people will be a system under pressure to change. How has Cuba’s economic system fared in the delivery of food? Has it fared well enough to defuse such a pressure for change? Or is difficulty in procuring food a source of popular dissatisfaction and a desire for change? 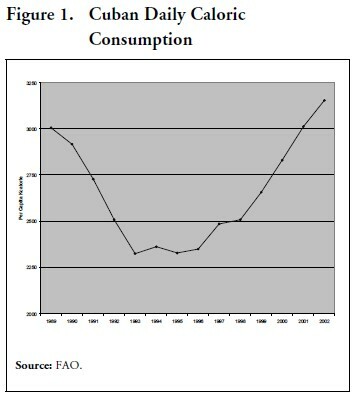 Data provided at the macro level by the Food and Agriculture Organization (FAO), displayed in Figure 1, portray a positive picture. After a significant dip during the critical years of the early 1990s, the per capita availability of calories is even higher than at pre-crisis levels. However, an analysis of the food market provided by Alvarez , with the assistance of Cuban researchers, suggests a rather different picture. As everyone familiar with Cuba knows, the country has had a food rationing system in place since the early 1960s. Under this system, every citizen is entitled to buy a predetermined amount of various foods at government-set prices. During the 1990s this rationing system has become more and more limited in what it offers in practice if not in theory. That is, items consumers have a right to acquire are simply not available. Accordingly, Cuban estimates cited by Alvarez conclude that the rationing system provides 49–61% of the calories, 40–65% of the vegetable proteins, 30–36% of the animal proteins, and 19– 38% of the fats of the daily intake of the Cuban population. In per capita terms, this nutrition costs in the range of 35–40 pesos, out of an average salary of roughly 220 pesos per month. Making the heroic (and wrong) assumption that everyone in a household who eats also works, roughly 180 pesos are left of the average salary. How much can those remaining 180 pesos buy? Suppose a person wants to eat one-quarter of a pound of meat a day, totaling 7.5 pounds in a month. The ration system allows one pound of meat and meat products every nine days, 3.3 pounds in a month. The person would need to acquire 4.2 pounds from the various food outlets described in detail by Alvarez, assuming that he can get his full ration. If he were to go to the Free Agricultural Market (Mercado Libre Agropecuario), where prices are much cheaper than at the Stores for Recovering Foreign Exchange (Tiendas de Recaudación de Divisas), he would see a price of pork of 25 pesos in Havana and 16 in Santiago. Out of his 180 remaining pesos, this person would have to spend 105 in Havana and 67 in Santiago on pork. Assume he wants to eat half a pound of rice a day as his main source of calories. The ration system allows six a month; he needs to purchase nine. This would cost him 45 pesos. He would have 30 pesos left in Havana and 68 in Santiago for all other household needs, including additional supplements to the diet such as fruits and vegetables. If this person needed to supplement the diet of a non-working child, then the impossibility of the task becomes even more readily apparent, despite the provision of free education, free medicine, and almost free housing. If the person made below the average wage (as around half the population do), the task is all the more onerous. The key question at this juncture becomes how sustainable can an economic system be where the person making the national average wage cannot earn enough to put sufficient food on the table, where he/ she has to engage in extraneous and uncertain economic activity merely to prevent starvation? Common sense would suggest that such a system could not be very sustainable. Yet a hallmark of the Cuban government and its economic system has indeed been its stability. How could this be? What makes that stability possible despite the pernicious food problem described above? One can think of the stability of the Cuban government and its economic system as a square table resting on four legs. One leg that may immediately come to mind is a formidable security apparatus that stifles dissent in a very efficient manner. Yet history—even Cuban history—is replete with examples of security systems that were overcome by popular discontent. Whether in Czarist Russia, the former German Democratic Republic, or even in Batista’s Cuba, history shows that when enough people say enough, no security apparatus can withstand the onslaught. All it can do is raise the number of people necessary to accomplish the job. But in Cuba there are many more people than necessary who are frustrated with the food problem. Stability must rest on other legs as well. Which are they? The Economist Intelligence Unit (EIU) [2004, p.6] points to two others. One is the participation of the population in mass organizations that lend a consultative approach to policy making and execution at the grass roots level. Local meetings are held throughout the island when potentially unpopular decisions need to be taken or have already been taken. An example of this was the decision to downsize the sugar sector, involving the shutdown of many mills. As described by Peters , meetings were held before the shutdowns to explain their necessity to the workers involved and to assure them other avenues of education and employment would be made available to them. These meetings have the effect of somewhat sweetening the bitter decisions the government feels it has to make from time to time. A third leg, also postulated by the EIU, is a deepseated Cuban nationalism that is stoked by a mixture of government manipulation and the hostility of the United States. Increased American hostility has the perverse effect of facilitating government manipulation via what could be called a survivalist rhetoric and attitude that, among other things, would make the people endure a food situation they might otherwise rebel against. Bastión 2004, the military exercises that involved wide swaths of the population, after new measures taken by the Bush administration to tighten the economic sanctions in the middle of the year is but a recent example. The final leg of stability is what could be called historical inertia. On the one hand, Fidel Castro is the only president most Cubans alive today have ever known, and he fathered a revolution and the only system of government they have known. Moreover, it is widely recognized that, for all its faults, almost uniquely it provides universal education, universal healthcare, excellence and wide participation in sports, and an improbably successful defiance against what is widely seen as American hegemony. To rebel against the father of the revolution, despite the everyday frustrations, may well feel like sacrilege. Unfamiliar with alternatives, longing for other leaders may also feel like taking a risk of going from bad to just as bad, or from bad to or worse. At the same time, those who hold hope for healthy change will probably look at the death of Mr. Castro as the natural turning point for that change, when the revolution becomes orphaned. Mr. Castro is reaching the end of a natural lifetime. To rebel now, while people can still get by, would seem almost pointless. Time will triumph relatively soon. Cuban stability rests on these four firm legs at present. But, by definition, a post-Castro government will have one missing leg: no historical inertia. Maintaining stability while placating a frustrated population tired of not being able to afford the food it needs, will become a Herculean task, in the absence of Castro’s ancient authority. The government will be like a square table on three legs. It will have no recourse but to address the food problem for the sake of continued stability and a prolonged political survival. A program of reform that stimulates agricultural production will be sine qua non for the preservation of the PCC. But how can food production be stimulated? The history of Cuban agriculture during the Castro era can be described as a tussle between a more productive private sector and a less efficient state sector. Alvarez  deals with this issue at length, but Table 2 can serve as a very brief synopsis. Despite generally poorer soil and climate, Florida’s yields far exceed Cuba’s. Lower yields do not indicate ipso facto lower economic efficiency, since land is only one of the inputs of production. But higher yields in the Cuban nonstate sector, despite the tendency to understate its results (discussed by Alvarez), do tend to highlight inefficiency in the state sector. 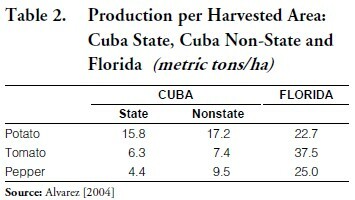 Moreover, experiments carried out over time such as the free peasant markets of the 1980s showed a high degree of responsiveness to incentives by Cuba’s private agricultural sector. This history is well known to Cuba’s leaders; they will have little option but to motivate private agricultural production once the fourth leg of Cuba’s political stability is removed by Fidel Castro’s death, in pursuit of lower food prices. Cuba’s future leaders might be tempted to limit a grudging opening only to agriculture. But it will be futile to do so, for agriculture is closely connected to the rest of the economy via the markets for inputs and outputs. For example, it will be difficult to lower prices if incentives are not placed in the efficient distribution of an increased food supply. Likewise, it will be difficult to foment continued growth in food supply if the supply of inputs such as tools, fertilizers, pesticides, and machinery is not made more efficient as well. There will be few alternatives to a progressive economic liberalization if the goal of lower food prices is to be achieved. Thus the continuation of the socialist system in its present form will be an improbable option for Cuba’s future. There will be a transition. The question, posed in the title of this paper, is which transition? 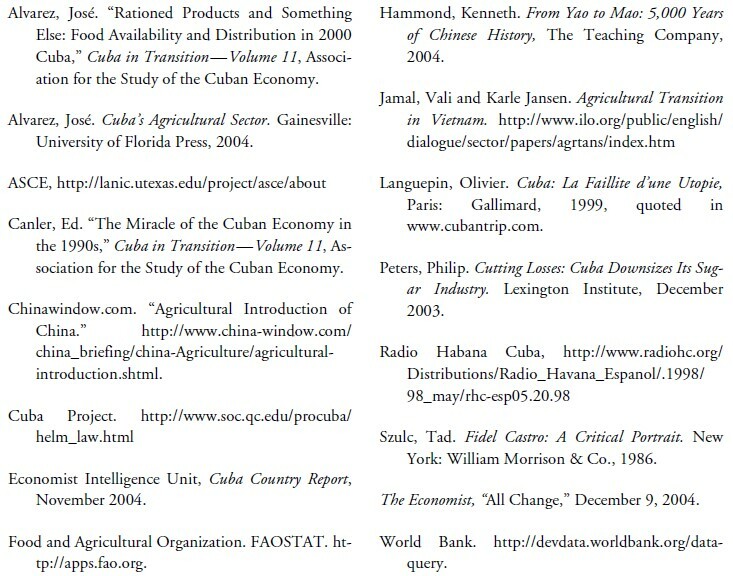 Much of the intellectual work done under the auspices of the ASCE, as befits its mission statement, has assumed that Cuba’s future will be more of an open society: economic activity is opened up to the private sector while participation in the political process is opened up to different ideologies competing for popular support. The experience of Central Europe and the Baltic States is commonly used as examples of this process. From Estonia to Romania, socialist economic regimes have disintegrated, as have the monopolies of power of the various communist parties. However, what is frequently forgotten is how the rise of communist regimes occurred in these countries. Almost without exception, they were imposed by an ascendant Soviet Union immediately following World War II. The regimes were not the result of native political processes, but rather an alien form of government imposed by a foreign power. Indeed native revolts against the regimes were put down by what could be termed the colonial power. The Soviet interventions in Hungary in 1956 and in Czechoslovakia in 1968 are but two examples. …the Baltic countries had the strongest incentive to reform when communism collapsed, because they were in the worst shape. Unlike Poland or Hungary, they were inside the Soviet Union, subject to the full force of collectivization and Stalinist central planning. Their economies had to be rebuilt from scratch. Second, the goal of EU [European Union] accession dictated a ready-made program of policies for all governments to follow. The Baltics did so most doggedly, for fear that failure might push them back into Russia’s orbit [author’s emphasis]. Reducing the Cuban revolution to its Marxist component would be a big mistake: the Cuban nationalism now personified de facto by Fidel Castro, is undoubtedly the genuine keystone of Cuban socialism resistance. Especially because it is also a question of resisting an external pressure which claims to impose its own scheme of transition: a sort of protectorate directed by the United States. In other words, the PCC resembles more the homegrown anti-colonial communist movements of Asia than those in Europe, and Fidel Castro can be likened more to a Mao Tse Tung or a Ho Chi Minh than to already-forgotten Central European communist figures. The result of the combination of the American economic sanctions program, Cuban nationalism, and deft manipulation by the PCC is a widely-felt apprehension over true American intentions for the island. This apprehension could easily be heightened, especially with more deft manipulation, during a post- Castro era, even if the leadership within the PCC is temporarily undefined. An apprehensive populace will likely cling to the PCC as the only known guarantor of state security, warding against possibly foreign- inspired chaos and mayhem. Thus national security concerns in a post-Castro Cuba will not urge a quick ditching of the PCC, as has happened in Central Europe, but rather the opposite. There will be no rush to adopt an open society model upon the death of Fidel Castro. • the population is at the same time widely frustrated with the perennial difficulties of feeding itself, along with facing other shortages of household needs. These security and economic factors will argue for the PCC to have a post-Castro grace period, but not an indefinite one. The length of the grace period will probably depend on the level of U.S. hostility and how threatened the population feels, a threat which will in all likelihood continue to be amplified by the PCC. Any drive for reform will also have to gather enough impetus to overcome the economic perverse effects of the sanctions on relative prices. (By increasing the costs of imports, insularity is promoted; by lowering the price of Cuban assets, openness to foreign direct investment is inhibited.) However, a PCC structure that tried to maintain the current economic model indefinitely will likely face increasing popular discontent in an era of inherent political fluidity. Eventually its survival will be predicated on the adoption of market-oriented reforms that boost productivity and lowers prices, especially in the agricultural sector. China and Vietnam provide precedence for this avenue. The pragmatist wing of the parties superseded the more ideologically purist elements after the death of the founding patriarch. Market-oriented reforms, starting with a decollectivization of agriculture, were put in place, resulting in increased output borne out of not just increased inputs but their reallocation in a more efficient manner. There is a rich literature covering the agricultural reforms in both countries, identifying successes, failures, and the limits of reforms. But for the relevance to a future Cuba we merely cite a couple of statistics. In the case of China, annual agricultural production increased an average of 6.5% in the 21 years following the first reforms in 1978 [Chinawindow. com]. In Vietnam agricultural gross output about doubled from the start of the decollectivization process around 1981 to 1995 [Jamal and Jansen]. The Chinese Communist Party has managed to maintain its leadership and to a significant extent to maintain its legitimacy. It is still accepted, perhaps not overwhelmingly loved and admired, but respected by the vast majority of the Chinese people. The foundation for this is really very straightforward, which is the capacity of the Chinese leadership to deliver steadily improving real standards of living, steadily increasing degrees of individual freedom to the Chinese people. A Cuban economy trashing the distortions and constraints currently in place can likewise increase its production and productivity. Household welfare will significantly improve, and as in China and Vietnam, the increased wellbeing will likely buy time for a homegrown PCC lacking its patriarch. Concurrently, the party would be able, with the help of hostile American policy, to continue to portray itself as the stalwart defender of national sovereignty during this period of transition. So the PCC following this Asian path may too become respected, if not loved and admired, providing economic as well as national security. It is fair to point out another Asian model: North Korea. After the death of Kim Il Sung, little happened in that country in the way of reform. But North Korea is a relatively closed country, even attempting autarky. Keeping the winds of reform at bay is relatively easy where foreign influences are minimal. Cuba, in contrast, is a relatively open country, highly dependent on foreign tourism and foreign trade. Moreover, it is culturally and economically tied to a relatively large expatriate community. This openness makes the North Korean option much more difficult for a post-Castro PCC. Current American policy toward Cuba is unambiguously directed at fostering an open society model. Sections 205 and 206 of the Cuban Liberty and Democratic Solidarity Act of 1996, widely known as the Helms-Burton Law, stipulate that for American sanctions to end, free elections must be held and the country be “substantially moving toward a marketoriented market system…” [Cuba Project 1997–98]. Absent these political and economic changes, American law requires that the sanctions program be maintained. Following the rationale of our analysis, the PCC will then indeed continue to have in a post-Castro era one of its props for survival. It will continue to be able to keep stoking Cuban nationalist fervor in defense of national sovereignty. This continued American hostility may well make it possible for the PCC to delay a reform program. Scaremongering against American interference could continue unabated instead. Political and economic entrenchment becomes more viable for the party, even if not indefinitely. In contrast, a hypothetical decreased level of American hostility would present a more difficult scenario for the PCC. Deficiencies in the economy, especially the high expense of food, will be seen more transparently as homemade problem and not one conjured up in Washington. And Fidel Castro would not be around to keep order and ideological purity. The frustrated population would be willing and able to demand change more readily, as different factions of the party vying for power try to strengthen their position with popular support. With reduced American hostility communist orthodoxy would soon be teetering on two rather than three legs. But this change would require, literally, an act of Congress that heavily would amend or rescind the Helms-Burton Law, which currently requires democratic elections in addition to economic reform. Were there a willingness to change the basic approach, the current American sanctions program is so wide and thorough that an easing of sanctions could come via many different ways: a relaxation of travel restrictions, widening the gamut of exportable products, liberalizing money transfers, etc. A careful study would be needed to identify which measure or combination of measures would more likely to promote change in Cuba at that time, both political and economic, but not necessarily subsuming the latter to the former. The conclusion we arrive at is that, barring unprecedented change, of the three general paths Cuba can take in the future, the most likely one is the one being least considered. On the island, official propaganda belittles any talk of a transition. Off the island, the supposition is that the open society model only awaits the passing of an elderly despotic leader. But we have argued that both history and the current experience in Cuba point to a third way, a way more akin to what has happened in Asia and what has been widely regarded as a favorable outcome. However, both the PCC and American policy appear set to try to frustrate this turn of events. Thus a post-Castro era will not necessarily signal an improvement of relations between Cuba and the United States, and American policy may well serve to delay an inevitable reform process in the economic sphere. But perhaps we should take hope that in the end neither of these entities will determine the outcome in a post-Castro Cuba. It will be the collective decision of the Cuban people.